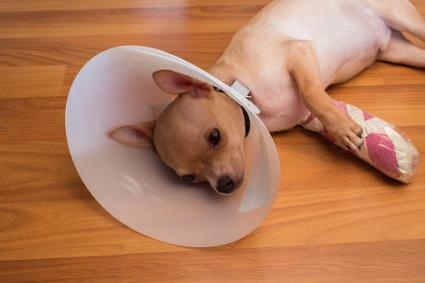 If your dog gets injured, it can be hard to know what to do. If you happen to see your dog get injured, pay close attention to what happened and what part of your dog may be injured. Some general signs of injury include bleeding, swelling, limping or an inability to walk. While many injuries can be managed at home, more serious injuries need the attention of a veterinarian. Fortunately, a dog's skull is thicker than a human's skull. However, that doesn't completely protect a dog from injury. Also, breeds with dome-shaped heads, such as Chihuahuas, may have a soft spot on top of their head that can make them more susceptible to serious brain injury. The most serious concern for a dog suffering a head injury is whether any brain injury has occurred. Symptoms that may indicate a brain injury include loss of consciousness, vomiting, a change in pupil size, or inability to walk. If you notice any of these symptoms in your dog, emergency veterinary care is required. A brain injury can be the result of bruising to the brain tissue, bleeding around the brain, or an increase in pressure within the skull. Bleeding from the nose can occur with any trauma to the face. You can try to hold pressure over your dog's nostrils to reduce the bleeding. Sometimes an ice pack on top of the nose can also help reduce bleeding. If the bleeding does not slow down in a few minutes, seek emergency veterinary care. If you suspect that your dog has an injured tooth you may be able to see the damage yourself. Other dogs may be in too much pain to allow you to look in the mouth. If your dog acts like he is in a lot of pain or will not eat, you should seek prompt veterinary care. Otherwise, schedule a visit at your convenience to have the tooth evaluated. The vet may need to sedate or anesthetize your dog for this. Ears bleed a lot and can make quite a mess. If your pet's ear is bleeding you can try to apply pressure to slow the bleeding. However, even minor ear injuries may require a trip to the emergency vet because as soon as your dog shakes his head, the bleeding will start again. Bandaging the ear can be tricky because bandages in this area fall off easily or are pulled off by your dog. If the bleeding does stop, try to keep your dog calm and quiet to prevent further bleeding. If you see a slice in the ear, you will need to see a vet within 24 hours of the injury. Swollen ears can be the result of injury. If your pet has a swollen ear and has pain or won't stop shaking her head, you will need to see a vet. For minor swelling, you can apply a cold compress or ice pack until you can see a vet. These symptoms can be seen with most eye injuries. More specific injuries can include a corneal ulcer, corneal laceration, foreign body, or puncture of the eye. The most serious type of eye injury is a proptosed eye, which is when the eye pops out of the socket. This is a shocking injury and can occur from major or minor trauma. If your dog starts squinting, you can monitor this for a few hours. In many dogs, squinting occurs from some minor irritant and resolves without treatment. If you think your dog sustained an eye injury and the squinting continues, immediate care is needed. All the other symptoms listed above should prompt an emergency visit. Eye problems can quickly develop complications which can result in more extensive and expensive treatment, loss of vision or even a loss of the eye. Most dogs with a leg or joint injury will start limping. Limping can indicate a strain or sprain, an overuse injury, or a flare-up of arthritis pain. With more serious injuries, your dog will not put the injured leg down at all or may not be able to figure out how to stand on the other three legs. If you see swelling of the leg or an obvious deformity, this can indicate a bone fracture or dislocated joint. In the rear legs, patellar luxation and torn cruciate ligaments are common causes of sudden lameness. If your dog is not putting any weight on one leg, you should see an emergency vet. For dogs with mild limping, limit their activity with no running, jumping, or rough play. Avoid stairs and only take your dog out for a very short walk on-leash. If the limping continues, you will need to see a vet. Do not give any human medications as these can be toxic to your dog, or can interfere with your vet's treatment. Bleeding from the foot is a common symptom of a broken nail. If you look closely, you may be able to see one of your dog's nails at an abnormal angle. If the bleeding has stopped and your dog is not in too much pain, you may be able to look at it further. If the broken piece of nail has already fallen off, no other treatment may be needed. If you see a piece of nail still attached, you will probably need to see a vet. If the foot continues to bleed you can try to apply pressure to the area if your dog lets you. See a vet for further evaluation. Minor back injuries can be hard to identify and may mimic several other diseases. Dogs with pain, an abnormal posture, or loss of appetite may have a muscular back injury, sprain, or a disk herniation. If you see wobbly hind legs, stiff front legs or an inability to walk, this often indicates a disk herniate. If your pet is having any trouble walking with the rear legs, seek immediate veterinary care. For dogs that seem to be hunched up in pain, see a vet if this continues for more than a few hours. If you decide not to see a vet right away, limit your dog's activity, with no running, jumping or rough playing. Avoid long walks and stairs. Do not give any human medications unless instructed by your vet. The most common tail injury in dogs is called limber tail or swimmer's tail. It is most common in active sporting breeds, such as Labrador retrievers. Dogs with limber tail will show a characteristic drooped appearance to the tail. They will have pain if the base of the tail is touched and will not wag their tail. In some dogs, the base of the tail will appear swollen. If your dog appears to be in discomfort, you will need to see a vet. Otherwise, limber tail will heal with time. If there is swelling or deformity of the tail, it may be broken. You will need to see a vet if your dog's tail is bent in an unusual direction, although treatment for a broken tail can be difficult. Several types of injuries can happen in any part of your dog's body. These include lacerations, bruises, and bite wounds. Bite wounds in dogs can happen when your dog encounters a wild animal or another dog. These injuries can be mild or severe and life-threatening. If your dog suffers from a bite wound you may see puncture wounds, bleeding, visible open wounds, pain, inability to walk, labored breathing or shock. It is always a good idea to see a vet if your dog was bitten by another animal. Sometimes the wounds aren't apparent until the vet shaves the fur from the area. It is best if wounds are evaluated right away, and at least within 24 hours of the injury. Immediate emergency care is needed for any small dog that was attacked by a larger dog, any dog that was picked up and shaken, or for any large amount of bleeding, large wounds, inability to walk or labored breathing. The same rules can be followed for lacerations that are not caused by bite wounds. If you can see an opening in the skin, you should take your dog to the vet no later than 24 hours after the injury. Smaller scrapes can be cleaned with hydrogen peroxide. If the wound is in an area that the dog cannot lick easily, you can apply an antibiotic ointment like Neosporin. If you aren't sure how badly your dog's injury may be, remember that they can't talk to tell us how bad it is. It's never going to hurt to have your vet take a look, even if you think everything's okay. Even the most vigilant pet owner can't keep dogs completely safe from injuries.